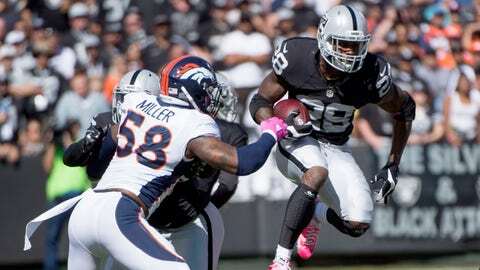 October 11, 2015; Oakland, CA, USA; Oakland Raiders running back Latavius Murray (28) runs with the football against Denver Broncos outside linebacker Von Miller (58) during the first quarter at O.co Coliseum. ALAMEDA, Calif. (AP) — The Oakland Raiders hope their sporadic running game can finally find some consistency now that Latavius Murray has fully recovered from a shoulder injury that slowed him the past few games. Jones is Murray’s primary backup and the team’s top kickoff returner. He also maintains unofficial hold of the title as the fastest player on Oakland’s roster despite missing 17 of the past 21 games with a foot injury. "Getting Latavius back to 100% and . with Taiwan being available helps us," Raiders offensive coordinator Bill Musgrave said. "The fact that (Jones) is available again should be a positive." That’s definitely how Jones views it, especially after initially thinking his season might end prematurely for a second straight year. A fourth-round pick in 2011 and one of the final players drafted by late owner Al Davis, Jones injured his foot while returning a kickoff against Cleveland in Week 3. It’s the same foot he broke in the season opener last year and sidelined him for the final 15 games. "I was real nervous which was part of the reason I didn’t play before the bye week," Jones said Friday. "Mentally I was like, `not this again.’ But it wasn’t as bad as we thought it was. Obviously it helped by not playing and then getting the bye week." "They’re a division team and it’s our first game coming off a bye week," Jones said. "We just have to take each game at a time, but this is the task in front of us. We have to focus on finishing this game." Jones is averaging 4.3 yards a carry, but he’s run the ball just seven times while playing sparingly on offense behind Murray in the first three games. Where Jones’ absence has really been felt is on special teams. He is averaging 30.3 yards on kickoff returns, the second-highest mark in the NFL, though Jones doesn’t yet have enough returns to qualify. "He’s a good football player, we’re glad to have him back," Del Rio said. "We’ll see how it goes." Jones doesn’t seem worried either way. After believing his season might be over when he got hurt, simply being back on the field is a solid enough first step. "Oh yeah," Jones said. "(First-round pick) Amari Cooper is probably second, but he just doesn’t want to admit it."